Iveco's new telematics system is now offered on Euro 6 compliant trucks in Europe. 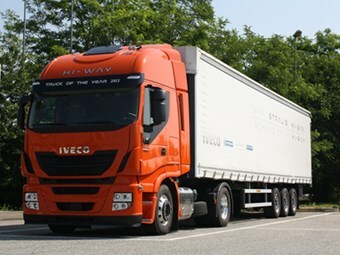 Iveco has joined the emerging telematics fray with the introduction of Iveconnect, the Italian company’s new telematics offering. The new system is now offered on Euro 6 compliant trucks in Europe and, as with most other systems, provides real-time monitoring of vehicle performance and location. The new system uses a colour screen inside the cab to also display information to the driver. Good driving practices and fuel efficient driving can also be ranked and displayed to the driver by the system’s driving style evaluation (DSE) feature. The DSE allows the driver to adjust and monitor their own driving behavior and to try and improve their score on the system. Fatigue incidents can also be monitored and reported. The telematics system can only be used in conjunction with the Iveco’s Euro 6 drivelines. I visited the Iveco test track at Balocco not far from the company’s headquarters in the north Italian city of Turin and took the opportunity to have a look at the new telematics system as well as drive the Iveco Stralis Hi Way in Euro 6 guise. The truck was a typically Euro specced 4x2 prime mover with a three-axle trailer behind at a gross weight of 40 tonnes. Under the cab was the 11-litre version of the Cursor engine rated at 450hp and backed by a 16-speed ZF automated transmission (AMT). Iveco’s Euro 6 solution gained some attention on its release two years ago as it is the only engine that meets European emissions requirements using selective catalytic reduction (SCR) only. All other manufacturers on the European market use a combination of SCR and exhaust gas recirculation (EGR) to meet the same standard. The 11-litre Cursor and AMT performed nicely during my brief stint behind the wheel of the cab-over and got up to the European highway limit of 90km/h without much fuss. The short wheel base and 4x2 configuration of the prime mover made it feel a little twitchy while on the move however I’d put this down to the fact that I’ve spent most of my time behind the wheel in 6x4 prime movers rather than any real criticism of the truck itself. The intarder engine brake however was impressive and a real standout of the drive and the truck required very little input from the brake pedal to bring it to a halt at European weight. The drive highlighted the peaky performance of the 11-litre engine and its engine braking capabilities. Iveco brand leader Stavros Yallourdis confirmed that the company will be bringing Euro 6 drivelines and Iveconnect into the Australian market at some stage in the near future. 2012 IVECO POWERSTAR ATN560 PRIME MOVER.